Texting My Pancreas: A Very Diabetes-y Weekend: Part Two. After the TCOYD festivities wrapped up, I headed back home. 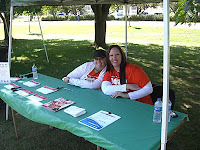 I had to rest up - Sunday was the JDRF Walk to Cure Diabetes in Lincoln! 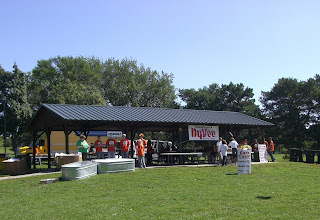 I've only ever been a walker and fundraiser at these events; this year, I also got the chance to staff a table. I was there to promote Juvenation, JDRF's online social networking community. As I've discussed before, the Diabetes Online Community (DOC) has been a great resource for me. It's amazing to me that even after 20+ years of living with diabetes, I'm still learning new things about my disease every day. Until I found the DOC, I never used words like bolus, SWAG, or my personal favorite, euglycemia. (It just sounds fancy! It means a 'normal amount of blood glucose'.) There is always someone out there who can commiserate when I'm running too high, or celebrate with me when I've had a good streak. I can get my questions answered by people who can best answer them - people who use the same therapies I do. Need a recommendation for CGM adhesive? No problem. Want to know how other people balance exercise and BG levels? Sure thing. Wondering if you're the only one who remembers when JDRF was just JDF? You're not. Juvenation was the first diabetes community I joined, and it holds a special place in my heart. 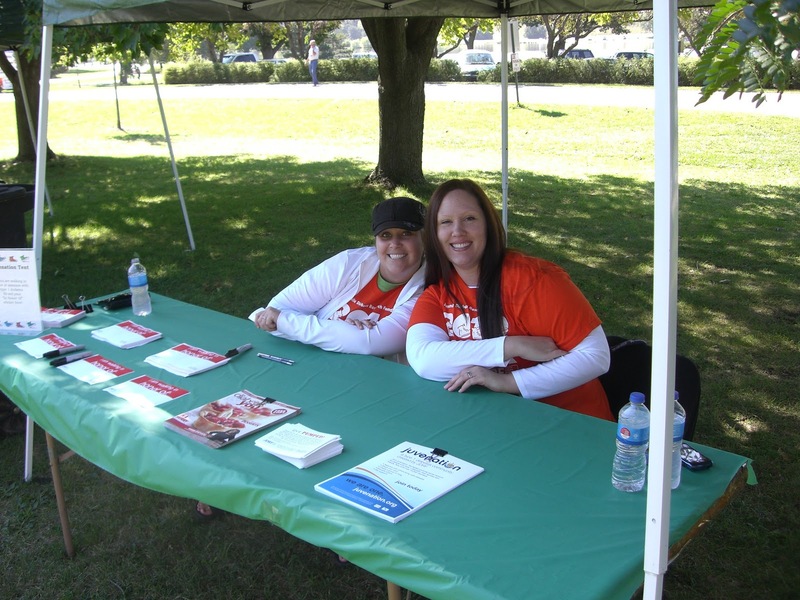 I was also able to make some new contacts at the walk, to help further my goal of "throwing out a line" this year. I've put my name in for a few different opportunities; we'll see if I get to wear any more hats, so to speak. I enjoyed getting to talk to the people who came up to our table - which amounted to quite a few, since we were the table with the ever-popular "I'm Walking In Honor Of..." stickers. A few stick out in my mind - the abundance of sorority members, all with stickers saying they were walking for "Molly" (how loved this Molly must have felt to see her name everywhere! ); the mother of a four-year-old girl, who showed off her daughter's OmniPod insulin pump to me when I asked who she was walking for. I could see that the girl was watching my reaction closely, and I was happy to come back with, "Oh cool! You have an OmniPod! I have an insulin pump too, see?" I pulled out my Animas Ping for her to see, and she smiled with recognition. It melted my heart a little bit. building I go into with food in it. AWESOME. 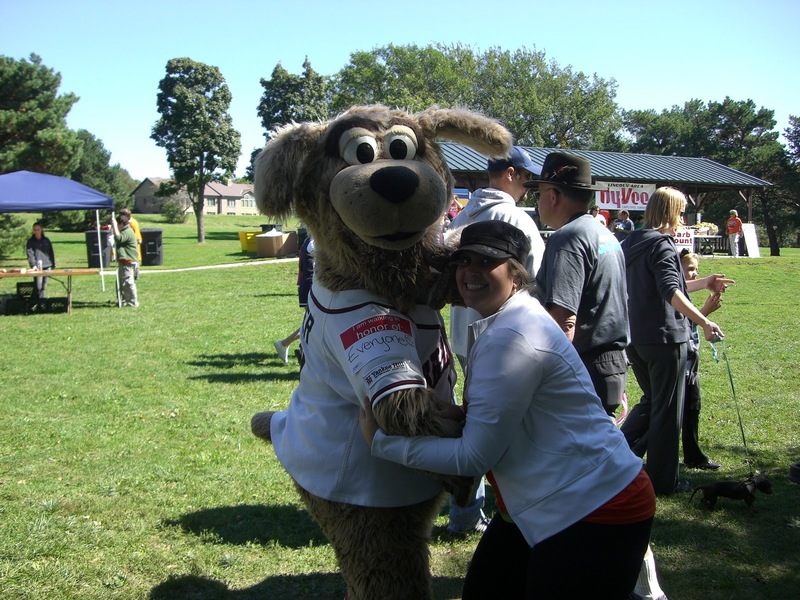 mascot, who will be "Walking In Honor Of Everyone". I'm so glad your walk was successful :o) I need to look into a Juvenation table at our walk next year. PPS. Puppies are awesome too! Even if they're big giant costumed ones. Enjoyed both posts on your weekend. I would be so interesting to attend something like that. This is so beautifully written! I walked for ADA yesterday in Indianapolis and connecting with the diabetes community, meeting new faces, seeing old friends was so soothing for my soul. It is a difficult battle with its ups and downs, but our diabetes community (online and offline) is a great one - people are so helpful, sympathetic, and determined. Thank you for sharing your part of the story!